The Grohe Ashford is an ideal choice for those who prefer the comfort and coziness of traditional or country decor but do not want to sacrifice convenience or functionality. 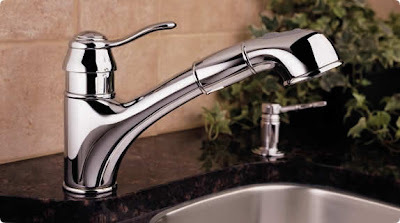 Utilizing a top-mounted single-handle style, Ashford’s spoon-type lever handle, handle cap, and spray head feature subtle details that define the traditional profile of the faucet. Performance features include a dual-spray diverter for fingertip control of both spray and regular flow water patterns, as well as the easy, and GROHE SilkMove® technology for effortless water control. Ashford is available in GROHE’s InfinityFinish™ satin nickel or deep, lustrous GROHE StarLight® chrome.